Ultra Fine Flair: Bunny Cake! Every year I make at least one bunny cake. 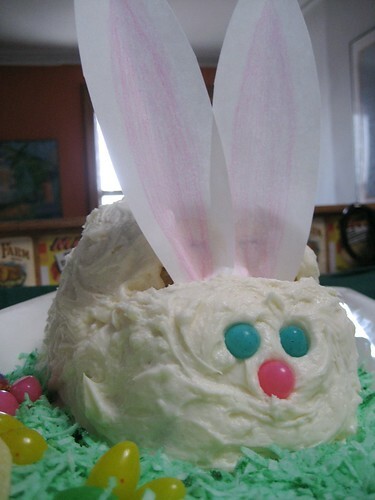 And every year I'm totally convinced that it's the cutest bunny cake I've ever made. This year I even took the time to write up the instructions for you, my loyal UFF readers, so that you too can create a bunny cake of your very own. • A yummy cake recipe (or a cake mix, no judgments!) 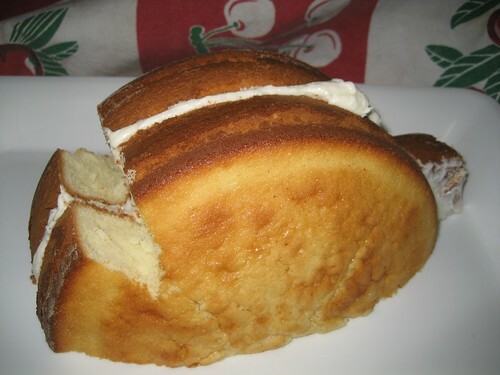 - I've made many a successful bunny cake with Epicurious' White Chocolate Layer Cake (omitting the apricot filling) but pick something that's easy for you. 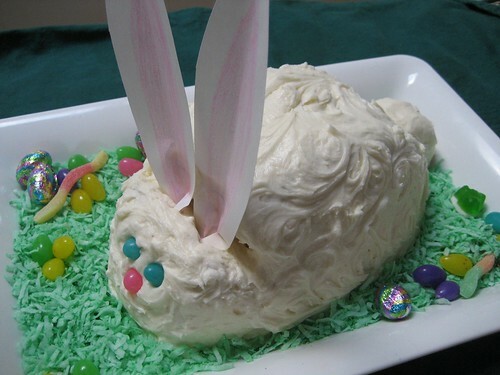 Carrot cake makes a sweet brown bunny. • A round cake pan. You only need one round layer to make the cake, so you can either make two bunnies, or use the rest for cupcakes. • Frosting (I'm going to recommend homemade for this, but only because I don't know of a store-bought one that isn't sickly sweet - funny that I used to be able to eat that stuff right from the cannister!). • Coconut (fresh coconut is delish but sweetened shredded coconut in a bag works just as well). • White paper (regular copier paper is fine) and the pink colouring implement of your choice (a crayon, pencil crayon, highlighter, whatever). • Jelly beans (for your bunny's eyes and nose, as well as to make a flowery meadow for your bunny). After you've baked your cake, follow these simple instructions to assemble the bunny. • Frost your bunny completely. The tail can get tricky; my best advice is to be generous with your frosting, and don't be afraid to sculpt the tail a little. • Dye the coconut to make grass: Put some coconut and a few drops of green food colouring in a ziploc bag and squish it all around. If you love coconut, keep some white to sprinkle on the bunny. Spread the green coconut around the bunny so that he's resting in a lovely meadow. • As you may already have deduced, the bunny's ears will be made of paper. I like to make them after I see my bunny so that they're proportional to his stature - chubbier bunny, chubbier ears. (Hehe, I said "chubby.") Cut your bunny's ears out of the white paper, and add a pretty pink hue to the insides. Tuck the ears behind the bunny's head (where you made the notch out of the cake back in Assembly Step 4). • Give your bunny jelly bean eyes and a nose. Voilà! Your bunny is ready to be the centrepiece at your Easter table. Not to mention dessert. G- You said frosting. We say icing in the country I am from, but luckily I know the translation. That's an awesome bunny cake, I especially love the little gummy worm in the meadow. Happy easter! The Amazing Race Is On! Charlie is ON THE WAY!